The Alberta government is taking action to prevent family violence by supporting organizations that address the causes and create local solutions. Minister Sabir with current FCSP grant recipients from Punjabi Community Health Services and HIV Community Link in Calgary. Organizations can now apply for Family and Community Safety Program grants that support their work to prevent family and sexual violence, promote healthy relationships and create inclusive communities. Successful projects work to connect community members and expand supports for diverse populations, including the disability community, and Indigenous and LGBTQ groups. The government has dedicated $5.5 million to fund the projects. Community-based and non-profit service providers are eligible for grants of up to $250,000. Since 2015, the government has invested $33.7 million in 121 community projects across the province. Almost half of the projects were delivered by agencies in smaller centres or rural and remote communities. 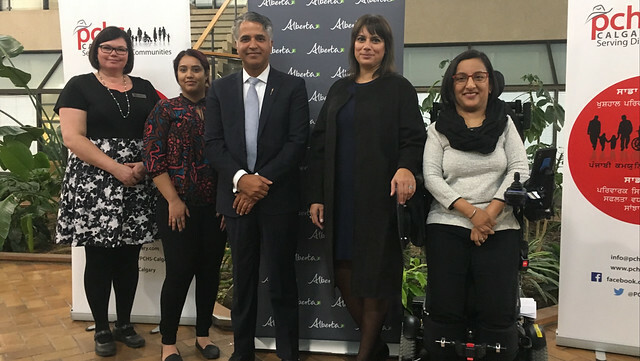 In the Calgary region, Punjabi Community Health Services received a grant to offer individual and family counselling for hundreds of people in Calgary’s South Asian community. The funding was also used to offer support groups for men and training for first responders. Other organizations that have received support include HIV Community Link and the Further Education Society of Alberta. Both used the funding to create new violence prevention programs such as outreach supports for underserved populations and literacy programs for vulnerable populations. Community-based and non-profit service providers are eligible for FCSP funding. Successful applicants may receive up to $250,000 for one year. Past recipients and those who have never received funding may apply. Email css.FCSPgrants@gov.ab.ca for more information.